Bill Pellington was born on September 25, 1927 in Paterson. He was a good all-around athlete who attended Ramsey High School, but did not earn a varsity football letter. Bill attended Defiance College in Ohio and played for the football team before transferring to Rutgers. Bill played for coach Harvey Harman, one of the most beloved figures in college football. The Scarlet Knights were basically a .500 team during the early 1950s, playing as an independent against Ivy League schools and some of the better local colleges, including Lehigh and Temple. Bill stood 6-2, weighed over 200 pounds at this point, and was an extremely aggressive tackler. But he was not viewed by the scouts as pro material. After graduating he did not get his first shot at the NFL until the age of 24, and didn’t make a team until he was 25. In 1952, Bill was offered a tryout in Cleveland by Paul Brown. Normally a shrewd judge of talent, Brown watched Bill play defensive tackle and offensive guard during a scrimmage and cut him. One year later he decided to give the pros another time. He hitch-hiked to Baltimore hoping to catch on with the Baltimore Colts. The Colts were made up of remnants from the disastrous Dallas Texans. Bill made the club as a linebacker and picked off a pair of passes in his rookie season. The Colts had a poor record in the mid-1950s, but they had the makings of a good team and, in Weeb Ewbank, a coach who knew how to mold talent. In 1955, the Colts played an exhibition game in St. Louis. During the trip, he met a Washington University coed named Micki Vukovich. They were married two years later. Micki became one of the leaders of the Colts wives, who were very active in local charities. In 1963, Bill and Micki opened a restaurant outside Baltimore, in Timonium, called the Iron Horse. It was known for its huge, NFL-sized portions. The Colts had their first winning season in 1957. Bill, who by this time was notorious for using his arms like clubs to fell ball-carriers, was the spiritual leader of a turnover-crazed defensive unit that included Gino Marchetti, Art Donovan, Big Daddy Lipscomb, Don Shinnick and Bert Rechichar. The offense featured Johnny Unitas, Alan Ameche, Lenny Moore and Raymond Berry. In 1958, Baltimore won the NFL West and defeated the Giants in a thrilling championship game. The Colts won the NFL title again in 1959. Despite his fearsome reputation, big-play skills and ability to analyze enemy offenses, Bill did not earn much in the way of official recognition. All-Pro and Pro Bowl votes at linebacker were not done by position, so although he was considered to be one of the best of his era at outside linebacker, middle linebackers Joe Schmidt, Bill George and Sam Huff garnered all the postseason votes. Ironically, when Baltimore moved him to MLB in the early 1960s, the voting changed and outside linebackers were finally recognized. Bill played his final season in 1964. The Colts went 12–2 and returned to the NFL Championship Game. He and Marchetti were the veteran standouts in a unit short on talent but big on heart. Bill finally got some long overdue love from AP voters, who named him second-team All-Pro at the age of 37. The Baltimore defense finally ran out of gas in the title game against the Browns. They lost 27–0. Bill Pellington was a leader by example on the field, and by deed off the field. When the players formed their first union, he was one of three reps elected by his peers in 1958. He was deeply involved in the NFLPA and their early court battles to gain recognition. 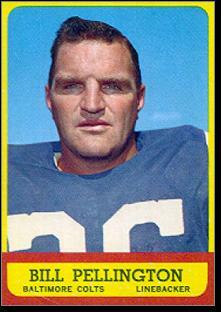 Bill remained a beloved Colt in his retirement, remaining in Baltimore the rest of his life. In 1990, he was diagnosed with Alzheimer’s Disease. He died in 1994.